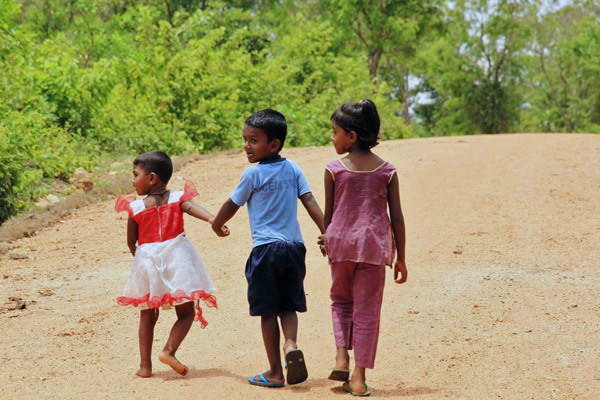 Well maintained internal access roads are vital for the smooth functioning of villages in rural Sri Lanka. Internal roads are used daily by residents to travel to their workplaces, agricultural lands and children’s schools as well as to access towns and marketplaces to buy and sell produce. When internal roads are in a state of disrepair, it severely inconveniences the community, particularly during the rainy season. 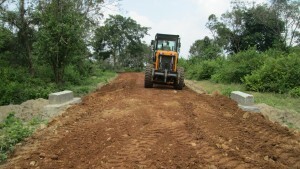 The project for Rehabilitation of Community Infrastructure, Improvement of Livelihoods and Empowerment of Women in the Northern and Eastern Provinces (RCI), funded by the Government of Japan, is supporting the construction of community infrastructure including 30 km of access roads in the North and East of Sri Lanka. 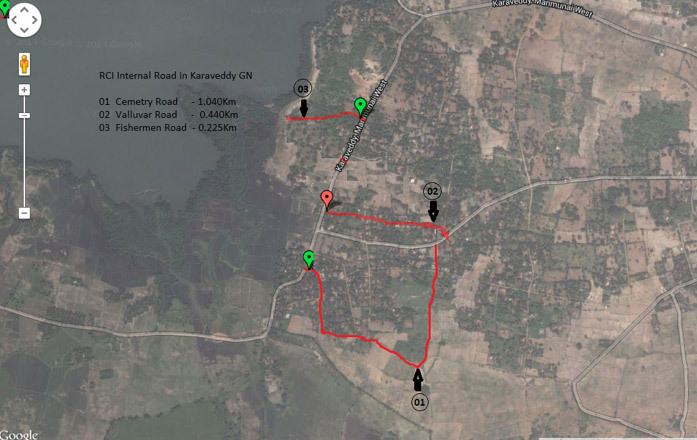 Three internal gravel roads in Karaveddy Grama Nildhari Division in Batticaloa district are being rehabilitated through this project. The RCI project is implemented by UN-Habitat through a participatory process with the community. Karaveddy GN Division consists of 584 families with a population of 1,929 people, located in the Manmunai West Divisional Secretariat (DS) Division in Batticaloa district. The majority of residents are engaged in agriculture while livelihoods also include fishing, livestock farming and casual wage labour. From the 1990s to 2006, the community was displaced on multiple occasions due to the conflict. Families had to move to safe locations elsewhere in the district, living with host families and in Internally Displaced Persons Camps. In 2008, they resettled in Karaveddy and started to rebuild their lives and livelihoods. Despite some infrastructure support, Karaveddy village required further support to improve their community infrastructure facilities. Due to the conflict, this GN division also has a large number of vulnerable residents, including 45 people with disabilities and 107 female headed households, who need additional assistance for resettlement. Road rehabilitation work in progress in Karaveddy village. To identify infrastructure needs of the village, a Settlement Improvement Planning (SIP) workshop was conducted by UN-Habitat in July 2014. This forum enabled the community members to identify priority issues and develop strategies to find lasting solutions. The Karaveddy community identified several urgent needs including the rehabilitation and extension of internal access roads as well as the renovation of storm water drainage systems. The rehabilitation of three internal access roads were selected for funding by the RCI project. The roads selected by the community are the Cemetery Road (1,040 metres), Valluvar Road (440 Meters) and the Fishermen Road (275 Metres). These three roads were in a state of disrepair making accessibility difficult. The “Fishermen Road”, the main access road to the irrigation tank, is used daily by the Karaveddy fishermen. 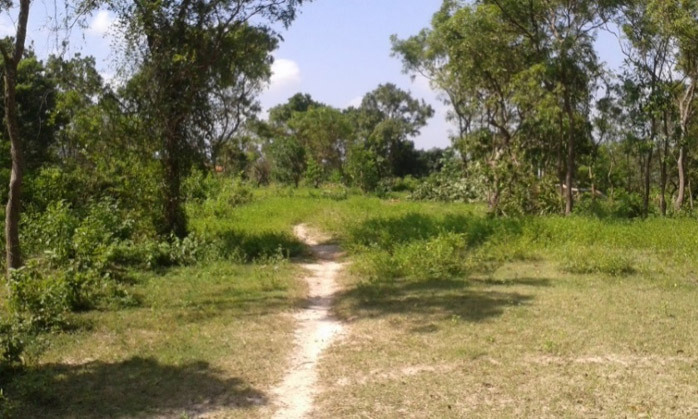 This road was overgrown with scrub jungle and was in a bad state of disrepair. 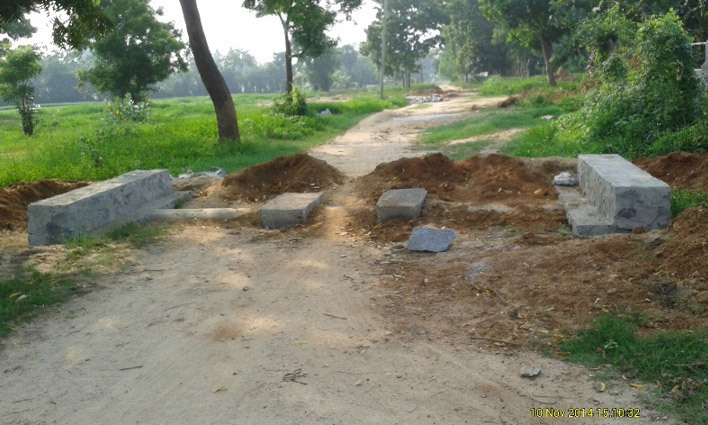 The Cemetery Road had been almost abandoned, with little rehabilitation work done except for occasional voluntary “Shramadana” (clean up) activities by the community during funerals. As UN-Habitat follows a participatory people’s process in implementing its programmes, the rehabilitation of the internal road network was handed over to a Community Based Organisation (CBO) in the area. Following a rigorous selection process, the Mullamunai Rural Development Society (RDS) was selected to manage the initiative. The RDS signed a community contract with UN-Habitat in August 2014 to rehabilitate a total stretch of 1.775 KM of gravel road. A grant of LKR 4,809,000 is being provided by the Government of Japan. The RDS is responsible for the hiring of skilled construction workers and to purchase building materials. The planning and implementation of the project is driven by the community while UN-Habitat provides technical assistance. Location map of the rehabilitated roads. Having obtained Provincial Council approval for the road rehabilitation work, UN-Habitat designed the road type plans and the Bills of Quantities to construct the three gravel roads. With the progress of road rehabilitation, the Mullamunai RDS has obtained their second grant instalment of LKR.1,683,150. The road has three double row, 2 feet diameter Hume pipe culverts, ten single row and 3 feet diameter Hume pipe culverts. All structural work has been completed and the remaining work includes road formation work such as filling and spreading of gravel, watering and compacting. The implementation of this project is driven by the community, with community members actively engaged in the planning and monitoring process. The Vavunatheevu Pradeshiya Shaba (Provincial Council) is coordinating closely with UN-Habitat on the road designs and Bills of Quantities. The Provincial Council is also responsible for the monitoring of the physical work in partnership with UN-Habitat. The “Fishermen road” leading to the irrigation tank, before rehabilitation. Government officers have been key stakeholders of this project. The Rural Development Officer of Manmunai West is working closely with UN-Habitat to implement this initiative – from the selection of the CBO to verifying financial and physical progress. The Grama Niladhari Officer has helped monitor progress and has the supported the RDS to expedite the work. “This project has given us the opportunity to work with the community and the Government. We now have a close bond with the community. Our sincere thanks to the Government of Japan for the financial support and to UN-Habitat for guiding us to rehabilitate this road.” Mr. Seelan, President of the Mullamunai RDS stated. The road construction is now well in progress and the RDS expects completion in a few months. Once completed, the internal roads will provide easy access to several locations within the village, particularly for the farmers and fishing community. Culvert under construction on the cemetery road, Karaveddy. The RCI Project is a community infrastructure development project, contributing towards the sustainable rehabilitation and reconstruction of the conflict affected Northern and Eastern Provinces. Funded by the Government of Japan and implemented by UN-Habitat, it is assisting communities to overcome the hardships caused by the lack of basic services, whilst rebuilding human capital and empowering women. Implemented in the districts of Kilinochchi, Mullaitivu and Mannar in the North and Batticaloa in the East, the key project interventions include the construction of community centres, preschools, storage facilities, small irrigation tanks and the rehabilitation of internal access roads and storm water drainage systems. It is built upon the “Project for Rehabilitation of Community Infrastructure and Facilities in the Conflict Affected Areas in Northern Province” (RCIF), also funded by the Government of Japan and implemented by UN-Habitat in Kilinochchi and Mullaitivu from 2013 – 2015.